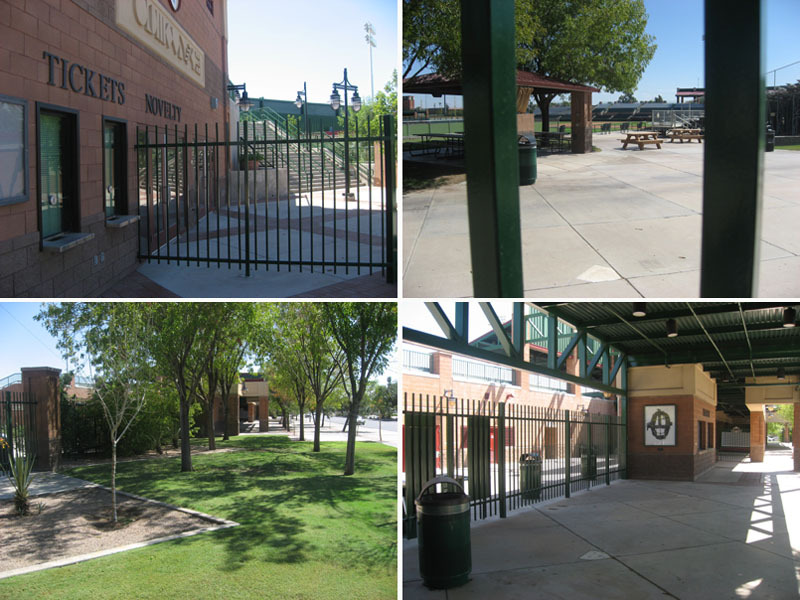 The day began with a late-morning drive to Scottsdale Stadium–the Spring Training home of the Giants. My friends Brad and Kevin wanted to show me how fun and easy it is to collect baseballs there, so we started by peeking through the fence at one of the adjacent practice fields. …and discovered that one of the main gates was wide open, so we headed inside. After drooling over the possibilities, we walked around the outfield to the third base side and cut back toward home plate. 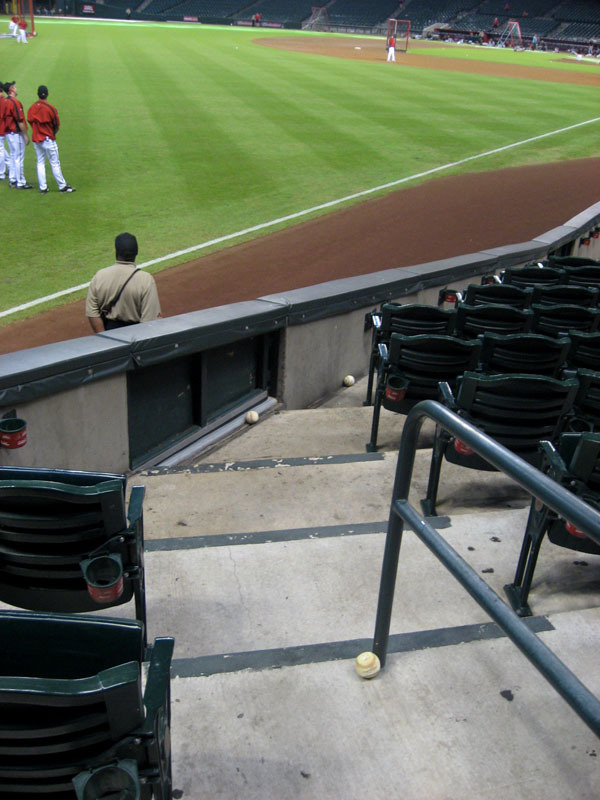 Experienced baseball collectors are always among the first fans to enter a stadium because of the chance to find “Easter eggs.” That’s what you call baseballs that are hidden in the seats. When balls land in the seats before the gates open, ushers are supposed to retrieve them and toss them back onto the field. But sometimes the ushers are lazy and leave the balls there. Sometimes the ushers can’t even find them. And sometimes there are balls that land in the seats right before the gates open, and the ushers don’t have time to get them. Yes, you counted correctly, there were TEN balls sitting on the dugout roof. Just sitting there. Were we hallucinating in the desert heat? Was this a joke? A trick, perhaps? One of those hidden-camera TV shows? 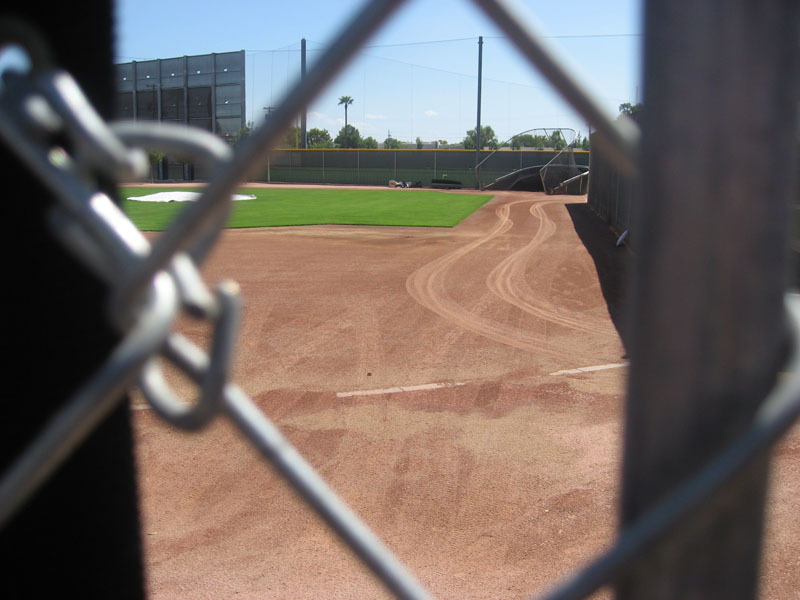 Fifteen minutes earlier, we’d seen a lone groundskeeper drive a golf cart along the warning track and off the field through an opening below the batter’s eye–and that was it. Once he disappeared from sight, there was NO ONE else around, and we didn’t know what to think. My first instinct was to grab the balls (if you’ll pardon the expression) and run like hell. But I didn’t. They were minor league balls. I only collect major league balls, and besides, I had two more days of snagging at Chase Field, and my luggage was already going to be getting a lot heavier–or so I hoped. As for my friends? Kevin decided that the right thing to do was to leave the balls there. “Good karma,” he said, explaining that the balls couldn’t even be considered “Easter eggs” because they HAD been found. Ten balls obviously hadn’t landed on the dugout roof and rolled into a tight cluster; someone had clearly retrieved them and placed them there (for what reason we didn’t know), and since we probably weren’t supposed to be inside the stadium in the first place, we all agreed the balls should stay. Then, as if the Easter Bunny itself was tormenting us, we spotted three more balls on the way out. We left those balls behind, too. 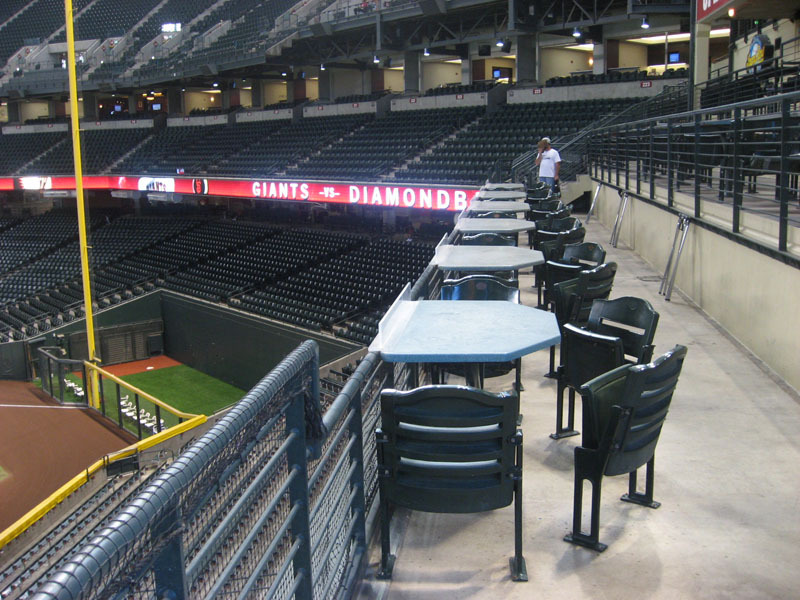 As for the Main Event at Chase Field, we got to the Friday’s terrace again at 3:30pm, and I snagged three more balls from Diamondbacks pitchers before the gates opened. The first was thrown from the bullpen by Edgar Gonzalez. The second came from Brandon Medders, and the third was tossed by Dana Eveland. I gave that one to a kid and discovered later that it was my 250th ball of the season. At about 4pm, Diamondbacks third base coach Chip Hale walked along the foul line with three balls in his glove, and just before he entered the bullpen, he tossed the balls into the empty seats. I had no idea why. At first I thought it was a random act of frustration, but then I wondered if the balls were old and if he just wanted to be nice and dump them where the fans could find them. But it was so early! The gates weren’t going to open for another half hour, and I didn’t think there was any chance that the balls would still be there when I ran inside. I’m not sure where Brad was at that point. I think he had already headed out to hold a spot at the right field gate. Kevin, meanwhile, had moved to the other end of the terrace and apparently hadn’t seen the balls get tossed into the seats, so I waited a minute and walked over and casually told him that I was considering entering the left field gate. I didn’t want to leave Friday’s too early. Batting practice was still taking place, and I had to keep my eye on the section in foul territory. Every few minutes, an usher strolled into the bleachers directly below to collect the home run balls that had clanged off the metal benches. Whatever. I didn’t care. All that mattered was my special spot down the line. At around 4:10pm, I had a scare when two members of the cleaning crew wandered down to the front row in foul territory and started sweeping, one section away from my hidden treasure. I was paranoid that they’d stumble upon it. But they didn’t. And for the time being there were no ushers in sight. Good karma indeed! To hell with the balls at Scottsdale Stadium. These three Easter eggs at Chase Field counted. I just had to make sure that I remembered which ball I picked up first, second, and third so I could number them properly. I looked over my shoulder, and there were a couple of fans slowly making their way down the steps. Crap! I snatched the first ball and stuck it in my front right pocket. Then I went for the second one, and as I stuck it in my left front pocket, I spotted a fourth ball down a few steps in the front row!! I grabbed the third ball (back right pocket) and then the fourth (back left pocket) and it occurred to me that there might be more. I scrambled back up the steps and scanned the empty seats on both sides and spotted a fifth ball!!! OH MY GOD!!!!! I grabbed that one and stuck it in a little pouch on the side of my backpack, and 20 seconds later, Livan Hernandez walked out of the bullpen and tossed me another!!! Are you kidding me?! 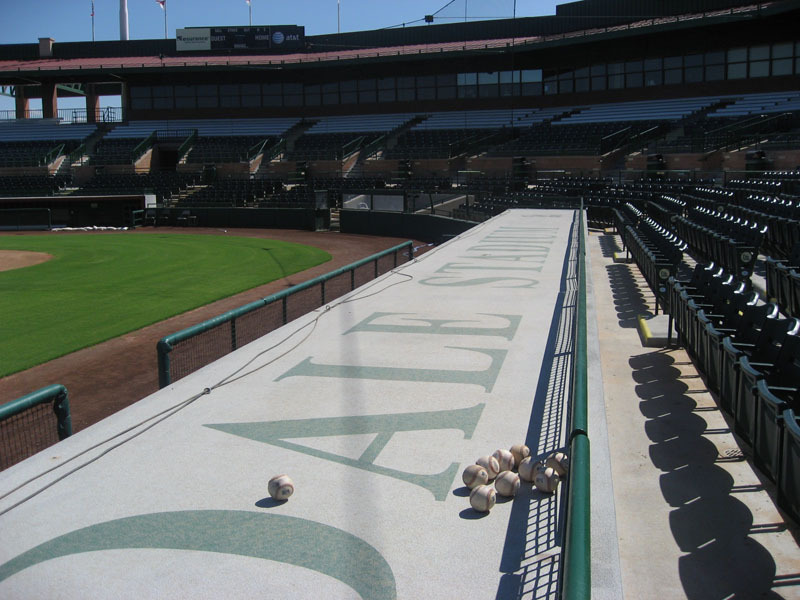 I’d just gotten six balls in half a minute, and I had to take a break and sit down and label them all, and just a few minutes after I finished, the Diamondbacks wrapped up their portion of BP, so I ran to their dugout on the third base side and got yet another ball from Doug Slaten. It was 4:40pm. The gates had been open for 10 minutes, and I’d snagged 10 balls. Naturally, when the Giants took the field, I was already thinking of breaking my one-day record of 19 balls. I was more than halfway there with almost a whole day of snagging still remaining, but I didn’t feel confident. If I’d been in Philly or Baltimore, I would’ve broken the record. Easily. Guaranteed. Those two ballparks are phenomenal. 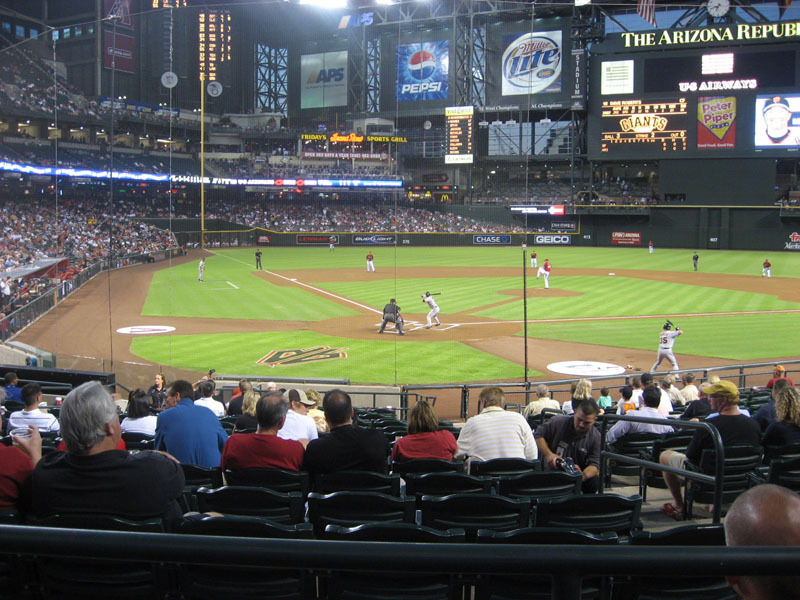 But Chase Field? Not great. Remember what happened the day before? Yeah, I snagged 12 balls, but it was somewhat of a struggle from start to finish. 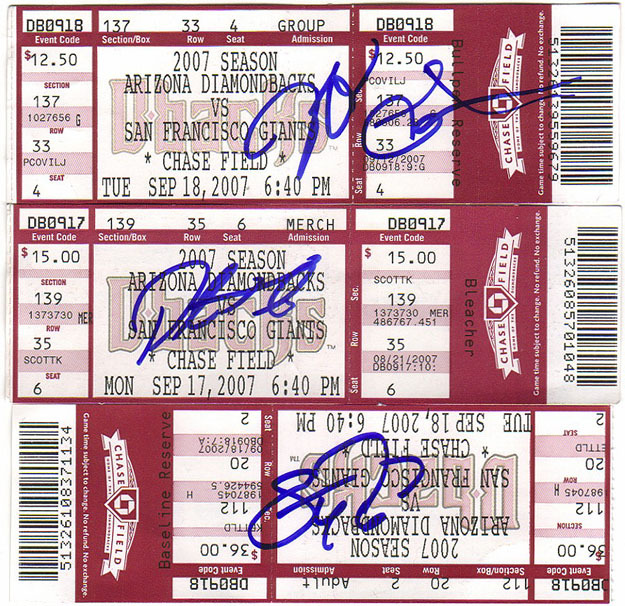 I hadn’t caught a single ball that was hit during BP, and then during the game, it had taken me six innings to sneak down to the Giants’ dugout for third-out balls, of which I didn’t end up getting any. I started out in left field for the Giants’ BP and didn’t catch a thing. Then, when a bunch of lefties began hitting, I ran to right field and managed to snag a Ryan Klesko homer that landed in a section of mostly empty benches deep down the line. Then I ran back to left field and caught a Scott McClain homer on a fly after judging it perfectly and climbing up on a bench at the last second. And then I got Randy Messenger to throw me a ball a minute later. With five minutes remaining in BP, I abandoned left field and ran halfway around the stadium to the Giants’ dugout on the first base side. What happened next? I stood there and watched helplessly as half a dozen homers landed right in the section where I’d just been. Batting practice was done, and I was stuck on 13 balls…not that I’m complaining, but there was no way that I was going to snag an additional seven balls from that point on to break my record. The good news is that I got Barry Zito’s sloppy autograph at the dugout. (Is that a backwards ‘K’?) The bad news is that he signed it upside down (on an extra ticket I’d collected the night before). 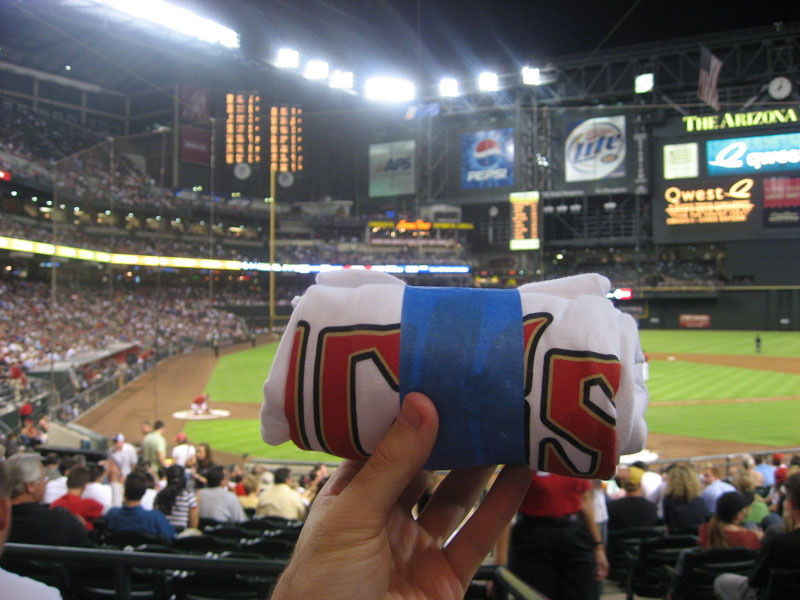 Sadly, my snagging highlight during the game was NOT getting a foul ball, but rather when the Diamondbacks’ mascot (a peppy bobcat named Baxter) threw me a tee-shirt between innings. The game itself was a thing of beauty. Rookie Micah Owings pitched a two-hit shutout, facing just one batter over the minimum, as the first-place Diamondbacks won, 5-0. After the game, I got my 14th ball of the day from home plate umpire Derryl Cousins (who names their kid Derryl? ), then collected a few dozen tickets stubs and went back out to the players’ parking lot with Brad and Kevin. In the four-part photo above, you can see the parking lot on the upper left, Stephen Drew in his obnoxiously large truck on the upper right, Pedro Feliz looking dapper on the lower left, and Bob Wickman on the lower right. • 261 balls in 34 games this season = 7.68 balls per game. • 2,900 balls during the 489-game streak streak = 5.93 balls per game. wow, 5 balls just sitting there when you walk in? I’ve never found an easter egg let alone 5 in one spot! How are you so lucky everytime? I never find any thing when I walk in, nor do I ever find the players parking lot after the game. WEll anyway, finding 5 balls just sitting there is like…a miracle!! 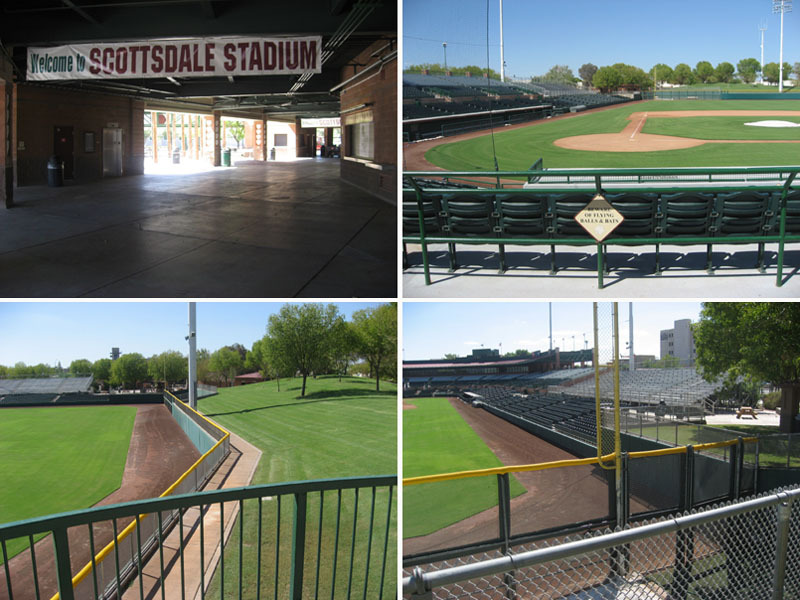 Congrats again, and that Scottsdale Stadium deck with both fields in view is pretty neat! thats amazing ive never gotten an “easter egg” though i always look. ill be at shea monday and tuesday vs the nationals. and probably the last game of the regular season at shea on sunday. front row seats monday, picnic area tuesday. if you’re home you should buy picnic area tix its great bp. ill give you the password if you need it if you dont get the newsletter online from the mets. goislanders-are you planning on going to shea tuesday with zack? and im a huge fan of the islanders they will be the huge surprise in the east this season, everyone counts us out since we lost blake and smyth. Zack, You know you could have gotten in really big trouble for sneeking in there. Also is it really true at you did not take the balls? how could he have gotten in trouble for sneaking in if the gates were wide open? if they cared they would have locked the gates. and why would he lie about not taking the balls? geez. What if those 13 balls laying around were major league balls? Would you have gotten them and not cared about “good karma”? yeah i love the islanders. it ***** that they lost smyth but i was surprised about blake. i loved jason blake. i also loved asham and he went to the devils. youre lucky, gjk. i was originally gonna go on wednesday but its gonna be crappy weather so if zack can than it will be tuesday. that would be awsome if you got to meet him. oh and congrats on the 14 balls. haha yeah i got that. good luck wednesday, pedros pitching. hopefully i can meet zack one of these days since i havent yet..
how the heck did 5 “easter eggs” get there???? Hey y’all, I’m an Islanders season ticket holder (I even wore my new DiPietro jersey to Yankee Stadium yesterday). However, Zack has requested that we stick to BASEBALL ONLY on this blog, so let’s honor that request. Zack, I’m enjoying your posts from Arizona and am glad you’re having a good time, but I have one question for you. I caught a ball in BP with my cap yesterday–and I’m shocked that more people without gloves don’t utilize their caps–and instead risk breaking their hands. Obviously, a glove is the first, second, and third choice, but do you have any thoughts on caps–the pros and cons? Thanks. Okay, maybe next year we can hook up for a game or two and i can finally meet you. I know, I still can’t believe it. I don’t even know what to say. I can’t imagine ever finding more at one game. 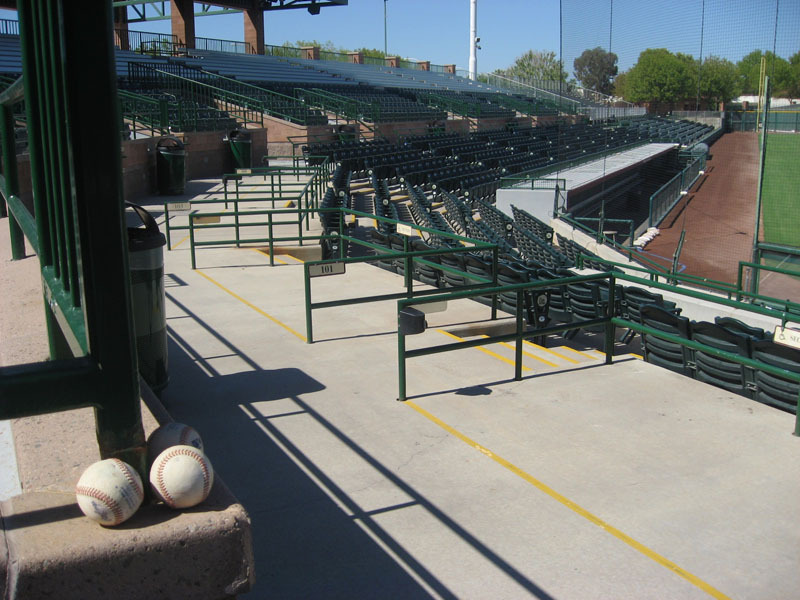 I think all those balls in Scottsdale were leftover by the instructional league players who were playing there. It’s all very weird. Thanks so much. I’m back in NYC now, so I won’t be able to make it out to Cheney Stadium this time ’round. Yup, I’m free on Tuesday, so if you want to switch dates at the last second, that should be fine. I’ll keep the day open just in case. Thanks for the “congrats.” I knew you were talking about me. C’mon, the players parking lot isn’t THAT hard to find. 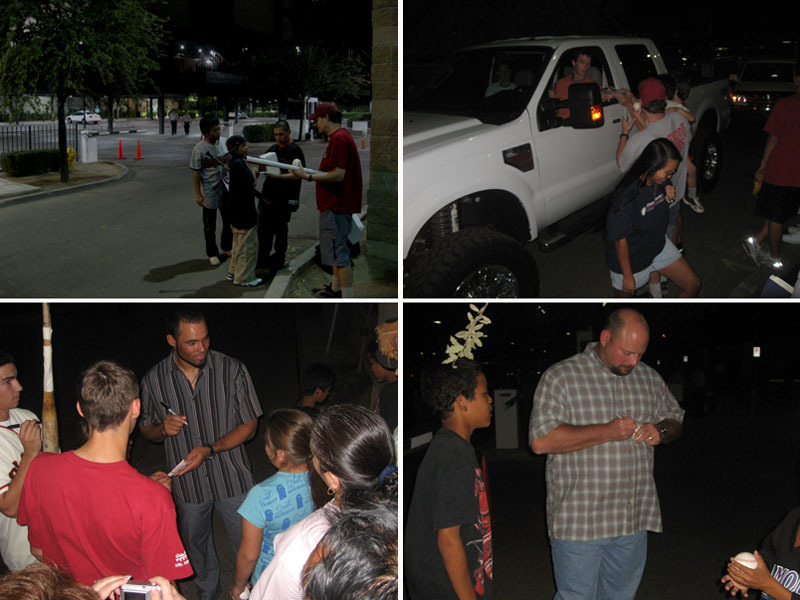 Just take a lap around the outside of the stadium about 30 minutes after the final out, and when you see a bunch of autograph collectors standing around, THAT’S where you should be. As for my luck…I don’t know. Things have just been going my way lately, I guess. Keep showing up early, and keep looking for eggs. You’ll find one eventually, and it’ll be a GREAT feeling. I’ll be at Shea on Monday, and possibly Tuesday as well. If not Tuesday, then definitely Wednesday or Thursday. This next week is pretty crazy (what else is new?) and I haven’t sorted it all out yet. If you can email me the password, that’d be awesome. I’m not sure I’ll be able to use it or make it to that game but it’d be cool to have the option. The bleachers are for Tuesday only? Hope we can finally meet up soon. It’s true that I was a bit nervous about getting into trouble, but I didn’t technically “sneak” in. As I mentioned in the entry, and as ‘gjk2212’ pointed out here in the comments section, the gate WAS wide open. It’s also true that we left all those balls right where we found them. 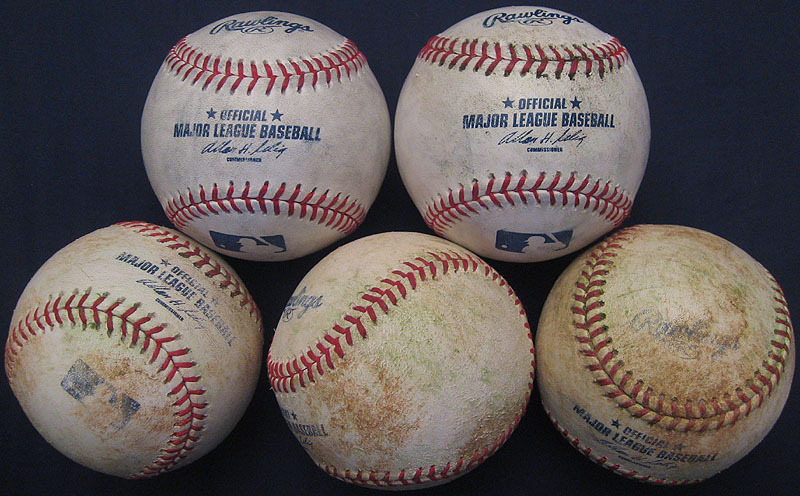 I still wouldn’t count major league balls from a minor league stadium, so if the balls themselves had been MLB balls, I don’t think anything would’ve changed as far as my taking them. But if I’d somehow wandered into a major league stadium and found those balls on a game day…yeah, I’d have to grab them, I think. Karma shmarma. Well, we know how three of them got there, but as for numbers four and five, I have no idea. They must’ve been in the seats for a long time because I was there at 3:30pm and didn’t notice any other balls (aside from the three) go into those seats. Off topic: What would happen if some player really wanted to add to your collection, and took a whole bag of balls and just handed it to you? would you count all of those? and just one more note about the dodger game. We didn’t originally plan on going. But we got to Los Angeles early, so I convinced my parents to take me over there. So I guess Dodger stadium beats no game at all. Nice snagging game Zack. I love snagging at Chase too. It’s a great park. I just read about your 13 balls!!! Outstanding job. Your sister and dad even got into the act. What a day for the family. I kind of started snagging late in life at age 32 believe it or not. My best day snagging is only 6 balls. So, you more than doubled my best in one day. Great job!! By the way, I snag pucks too. I started doing that way before I was a baseball snagger. Just thought I’d tell you. Wow. Nothing like that would ever happen to me. I would have stumbled upon the first ball, started to label it, walked away, and then watched hopelessly as some lucky kid who’s never gotten a ball before finds the other four. I have a crazy week coming up. I’m going to games at Shea on Monday, Wednesday, Friday, and Sunday. I’m also going to Game 2 of the NLDS at Shea (assuming the Mets don’t blow this and assuming that my classes don’t interfere). I need 32 more baseballs for 200 this season. 6.4 balls per game? That could be done. Leigh: How many pucks have you gotten? I’m psyched for the Isles home opener in 2 weeks!! Zack, what’s your record at Yankee? 14? Puck Collector, when you’re old enough to ride the subway alone to Yankee Stadium, then you can disclose your age. I can’t believe the regular season is almost over. If I can get away from work tomorrow, I’m using my tickets dated April 25 for tomorrow’s Yankee-Blue Jay game, which was called-off for rain just as I was getting off the train at the Stadium. Is is five months later already? Oh well. If anyone in Manhattan wants two free tix to the Mets game on Wednesday, let me know. The seats aren’t so good–they were giveaways (Mezz Res Sec. 29) to Islander season ticket holders, but they’ll get you in the ballpark. I guess hockey and baseball CAN mix. I got CUBS PLAYOFF TICKETS! do you know how rare that is? So 4 for the regular season…. I guess that’s a one season record for me… pathetic, haha. 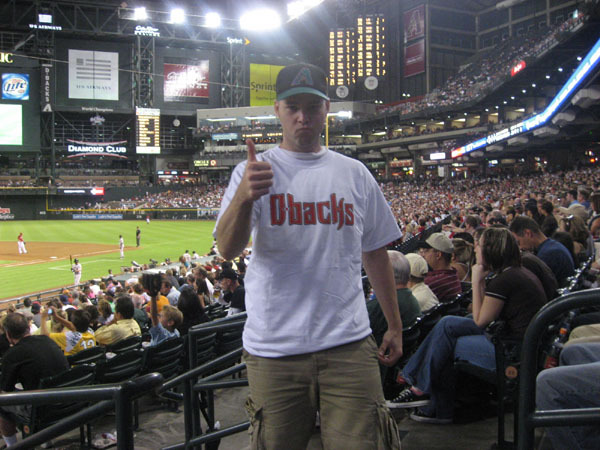 Maybe it’s just me but the D-Backs new Red Colors just ugly if someone is wearing an old Arizona Cap Pre-’07 with the Green and Purple. Has there even been an encounter prior to that where you’ve found more than one ot two balls just lying there? Exploding balls…that’s all I need. I’ve often thought about the bag-of-balls scenario, and I’m not sure what I’d do. I guess I’d have to count it, but I suppose there’d be an asterisk. Congrats on the getting playoff tickets. That’s truly awesome. You HAVE TO let me know how it goes. Thanks very much. I had no idea it was such a good place until this trip. Before I left, I was just hoping to get 20 balls combined in the three days. Meanwhile, you need a double-digit performance, but if you never play the dugouts, that makes it really tough. Funny. And a crazy week indeed. I gotcha. That makes sense. Doesn’t hurt to play it safe. My record at Yankee is 14. I was nervous that you were going to break it, but of course I would’ve been happy for you. First of all, great email address. Secondly, thanks for offering the tickets. I personally won’t be able to use them. I’m free that day, but I need to take some time away from the ballpark(s) and catch up on the rest of my life. Well, the fact is that I likely would’ve been in that section because I have a friend at AT&T Park with lots of tickets there. That’s how I ended up in that section during All-Star Week. But whatever. The ball landed about ten rows back, so there’s no way I would’ve caught it. I can’t remember ever finding more than one ball, although I’m sure it’s happened. Maybe two a few times. But five? That’s just absurd. I like the D’Backs new red look, but it’s certainly not unique. (4 years later) I can’t get over that shot of both fields 400 feet away. That is just soooo awesome.